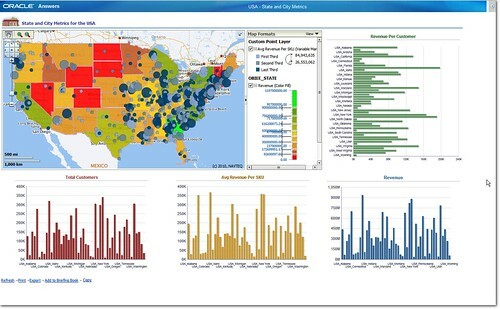 Oracle Business Intelligence 11g has finally gotten going with a whirlwind release tour that started in early April 2010. Today’s launch party takes place in one of the largest business cities in world, New York, NY USA. After much beta testing, and hush-hush, behind the doors secrecy, this clandestine tool can now be seen via a myriad of marketing paraphernalia online as presented by Oracle. There are a lot of great resources, break-out session videos, keynotes, etc provided on the Oracle site. One of my favorites is a side link at http://ht.ly/2bADM which provides some great webcasts on the topic. Get ready to see some great in-depth detail on ArtOfBI.com. We are stoked about the EPM/BI integration that now doesn’t have the limitations that 10g had. Everything is better in this version as one could only expect from the amount of delay and anticipation this release has brought upon the Oracle BI communities. We are looking forward to sharing more detail on the topic. Take a look at some heads up resources from Oracle, et al. I think you’ll find most of the initial collateral most exciting.